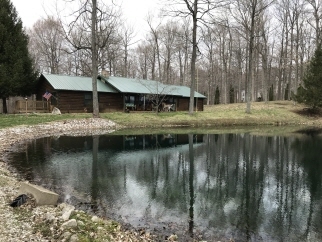 Custom 4BR 2BA LOG HOME OVERLOOKING STOCKED POND ON 4.65+/- ACRES. Nice covered front porch to enjoy and sitting just a few minutes from town in the country. Kitchen and dining room have nice hardwood floors. Large MBR has a private deck to enjoy watching the wildlife. Large living room with stone fireplace. Insulated and heated 24x36 polebarn. Bring your fishing pole and relax.